Pastrami was something that always came up in New York sit coms. "Pastrami on rye" was often delivered to people in brown paper bags in shows like Night Court. I remember Nanny Fine bitching about the pastrami getting a "rainbow" after sitting around too long on a platter. The pastrami I grew up with was super lean and totally unremarkable. It's spicy coating was purely visual, it seemed to contribute nothing. I couldn't have told you what it was. Considering it should have been largely black pepper and coriander seed, that is surprising. When I went to the states for the first time as an adult, I decided to eat as much of it as possible and find out what all the fuss was about. I ate a lot of Reuben sandwiches. The majority of them were great. Even at the deli counter of your average supermarket, they sliced it off a huge whole piece. It was the way they piled it on and served it hot that really got me. It has a much more unctuous texture and the fat plays a key role in the flavour. The best pastrami I had was made by Wise and sons in San Francisco. They had a stall at the farmers market. I watched them slice the brisket to order from huge juicy slabs. I tried not to giggle and stay cool. Pastrami in New Zealand tends to be a small cylinder of what appears to be topside or silverside. In the states it is generally brisket, one of my favourite cuts. Brisket is usually threaded with fat that renders through the meat keeping it lovely and succulent (see photo above). It's also a big slab of meat. It encourages you to be generous. I've been working on my pastrami recipe for 4 years now. I think it's finally getting there. The biggest development has been using sous vide techniques to cook it after all the curing and smoking. It yields a delicious, moist result. Don't let the cold smoking and sous viding put you off making this. You could omit the smoking and steam it rather than sous vide it and still have a great result that would hopefully encourage you to make more of these crazy meat products! The brine below is from Modernist Cuisine by Nathan Mhyrvold. 1 bay leaf, torn up. This amount of brine should easily cure 1 whole brisket. Remove all the obvious surface fat from your brisket but don't dig too deep or you'll break it apart. We want internal fat anyway. Slice the brisket into manageable pieces. You need to pay attention to the grain here. You want to have a nice piece of pastrami that you can easily slice across the grain when it's done. Also you need to be able to fit the pieces into sous vide bags. Submerge the meat in brine and then cure for 7 days.. There are a couple of approaches for this. You can put the meat in a bucket or large non-reactive container and weigh it down so it stays submerged. Or you can place the meat in vacuum bags or large zip- loc bags and seal it in with the brine. This is tidy. I like it. 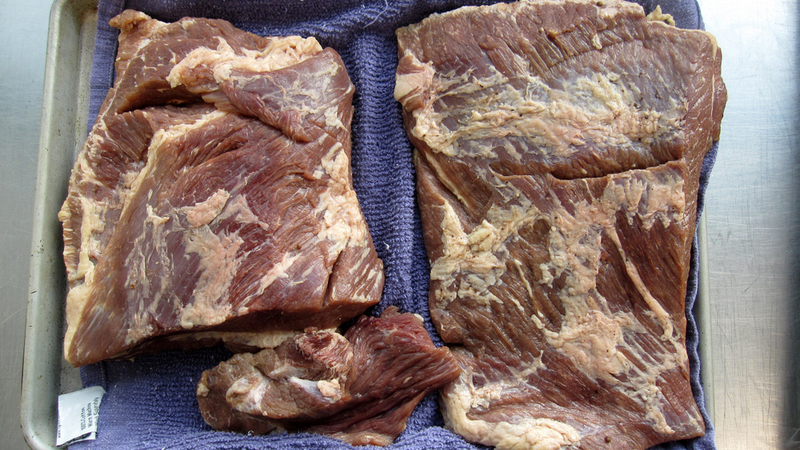 After seven days, remove the brisket, rinse and then dry thoroughly with towels. Place it back in your fridge for at least a day and up to 3 days to get a nice tacky surface. Coat each piece of brisket well and then cold smoke for 10 hours. After cold smoking you can either sous vide the brisket for 72 hours at 62 degrees Celsius or use the traditional method and steam the pastrami until tender. Steaming works just fine but you do get a juicier, more tender result from cooking it sous vide. When it's time to eat it, don't be frugal. It's time to pile that pastrami high on good rye bread with sauerkraut and Russian dressing (ie. Marie rose with horseradish in it) . It's fine cold but amazing hot. Warm it up in a steamer or use the sous vide machine again if you can be bothered.